I've killed more rosemary plants than I can count. Plants I've bought, plants that were given to me, plants in containers and plants in the ground. One glorious summer and then, bam. Dead. I keep trying because I love rosemary. It's delicious in soups and chicken dishes, and I absolutely love the scent. Brushing my fingers along the leaves releases that wondrous fragrance, and I breathe deeply. 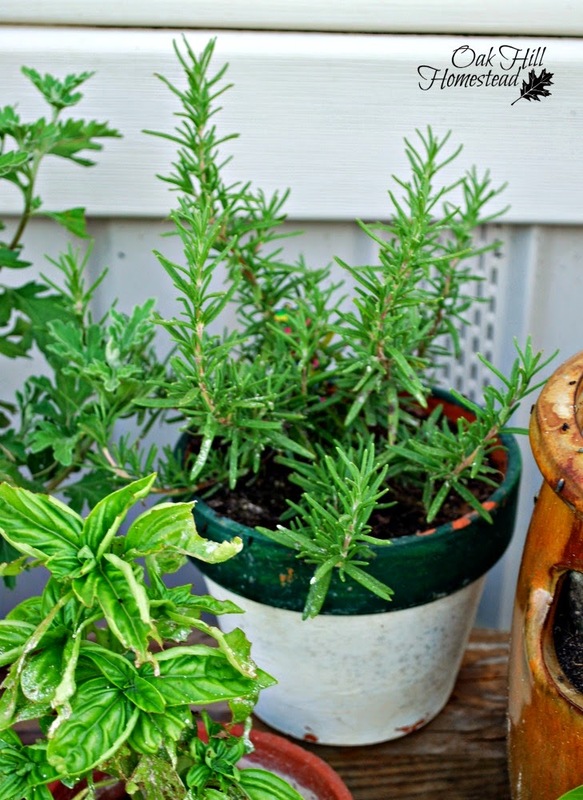 Did you know that the scent of rosemary can improve your memory? New research shows that it might even help to treat dementia. Last year when I brought my potted herbs indoors for the winter, I did some research on keeping rosemary as a house plant. It likes humidity, and misting regularly is recommended. Since that summer's plant had survived into the autumn I was really going to try to keep it alive, and I also thought I'd start a few new plants too. Maybe one of them would survive. Here's what I did: I cut several three-inch sprigs from a "green" (not woody) stem, pulled the leaves off the bottom of each stem, and stuck them in water where they would, I hoped, grow roots. And hopefully, if the mother plant didn't survive one or more of the new starts would. I nearly lost the mother plant before spring, but she recovered. While rosemary likes humidity, it hates wet feet. Finding that happy medium of enough water vs too much water was difficult for me. Most of the cuttings survived too. After about three weeks I noticed a tiny white root, and as time went on there were more. I misted them with a spray bottle of water to increase the humidity. I potted them up before spring came, and then had the same struggle of how much water is enough water again. I lost a couple of them, then gave the survivors to a friend who ironically had lost her plant over the winter. 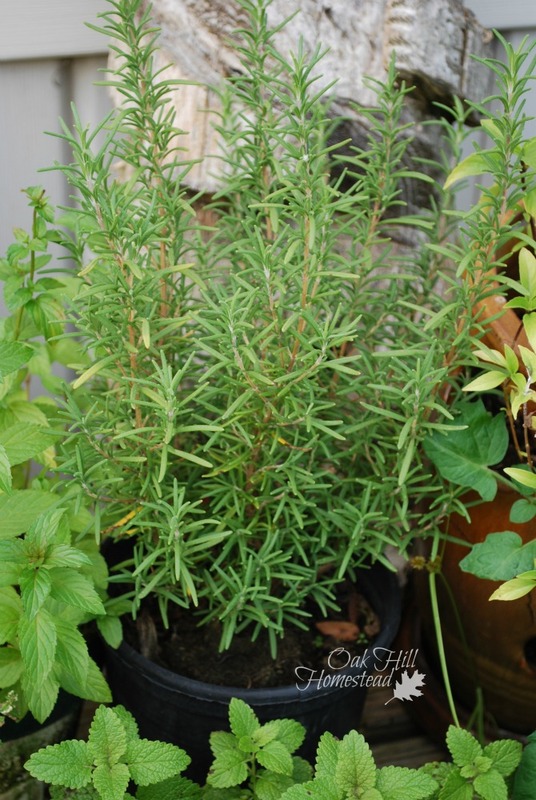 Now, at the end of another glorious summer, my rosemary plant is two years old and still doing well. She'll be coming indoors again before the first frost, and has an abundance of green stems that I have already taken cuttings from. Hopefully I'll have a couple of new plants this spring. And hopefully the mother plant will live another glorious summer or two. Do you love rosemary as much as I do? Have you been able to keep it alive for long? Thank you, Jes. It's really pretty easy now that we know the "tricks". Good luck, I hope your attempt will be successful! This is awesome!!! 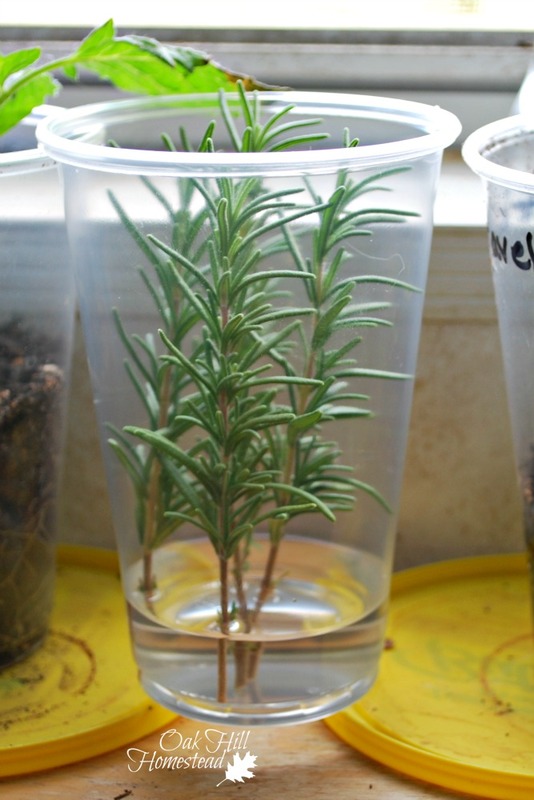 I didn't know you could root rosemary in water, as I thought the stems would be too woody. Yay!!! 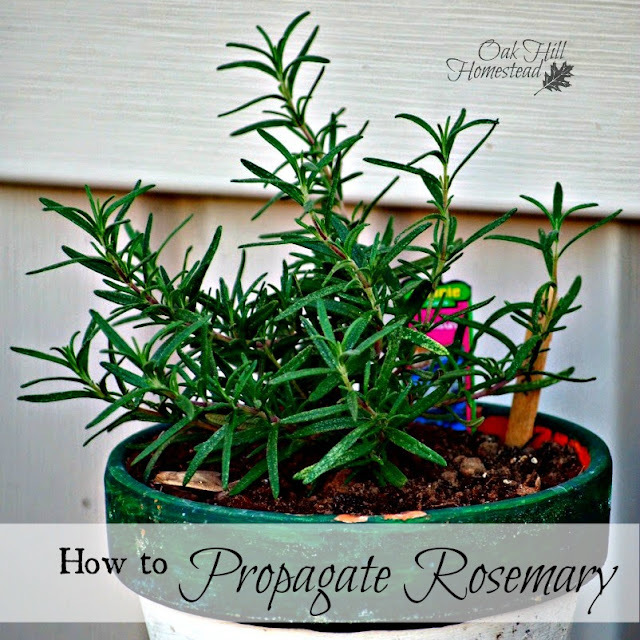 I am going to try this before my rosemary is done for the winter (mine doesn't make it through the cold here). Thank you! I'm glad it was helpful! Yes, take those cuttings from the green stems, not the woody ones. It works! Last week I wrote about rosemary because I also have had such difficulties growing rosemary. Until this last year and I have the most beautiful plant. We're getting ready to sell our farm. So the dilemma is do I propagate or dig up the plant and take it with us when we move? I may just do both. I found watering is key with this beauty because if you over water bye bye they go. I'm sorry to hear that you're selling and moving but hope it will be to an even better property. I'd dig up the rosemary AND propagate some cuttings so I'd have a better chance of having one survive the move. They are sure finicky plants, aren't they? That happy place between too much water and not enough water (my problem) can be hard to find, but it seems to be the secret to a lush and happy plant. I've tried to grow Rosemary a few times with no luck. I grow a lot of other herbs so it's frustrating to not be able to grow it. If I try again, I'll try your suggestions. Thank you for the tips! 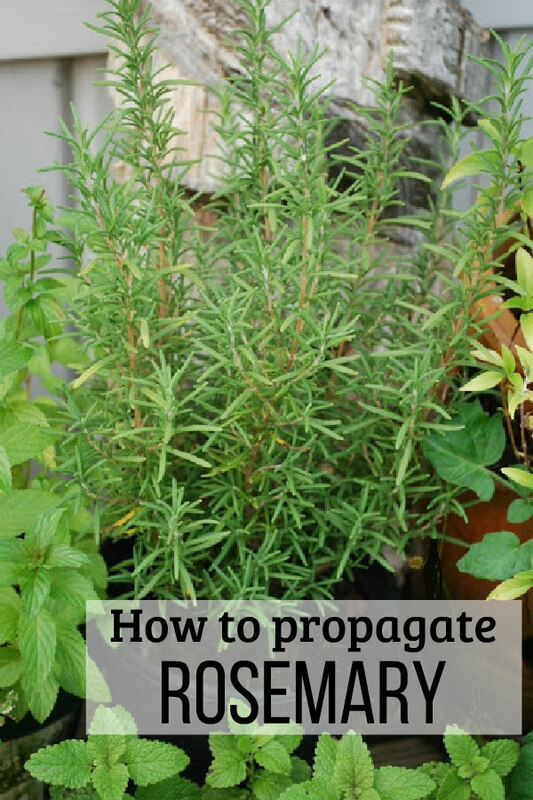 Rosemary is amazingly finicky. It makes me feel better to know that others have had the same problems I've had with it, Michelle. I hope these suggestions will help you the next time you try to grow it. I've heard that Rosemar is good for your memory, but I've never tried to grow it. I need to start a herb garden next year! You should definitely try growing herbs next year, Deb! Julia, you must have the perfect climate or at least the perfect "spot" for that plant! How wonderful that your plant has lived for so many years. Check in spring for those green tips so you can take some cuttings. Even though spring is the best time, I found half a dozen green shoots on mine. I hope you will too, Margy. Thanks for this helpful information. I'm going to give it a try. Ours do survive outside (they're not in pots) all winter, but I'd love to start some more. Ours grows outside year-round, so I don't really do much to tend to it. I think I will take some cuttings though, and start another plant or two. It would make a great privacy hedge in the back garden. I have a Rosemary bush that is trying to take over the garden! I don't know what it is - it's one plant I can grown. I was pleased to read your post, Kathi, as I've been thinking of removing the plant but don't want to lose it completely. This is a great way to start over! Pinned! Thank you for sharing with us at Hearth and Soul. April, I am in awe of people who can grow huge rosemary bushes! Mine can't even be called a "bush" and I'm just happy I've managed to keep it alive for a year and a half. I'm glad that this post filled a need and gave you a suggestion for starting over. Good luck, and thank you for sharing! I love this post! I ended up cutting my rosemary down last year as it got just to much! But will start again and keep this! thanks for sharing at Country Fair Blog Party! Thank you for visiting, Jan!